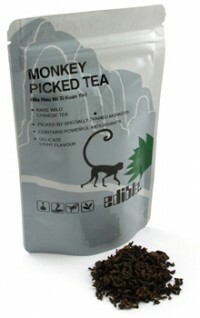 Ever drink monkey picked tea? We know, it sounds odd. Why would anyone want to drink tea that has bee picked by a monkey? Does it make it taste any better? As the story goes, this is some of the best tea available, but the trees it grows in are too high, and the mountain face where the trees are is too steep. However, the tea is so delicious that the locals had to have it - so they trained monkeys to pick it. Fast-forward to today, and the practice of monkeys picking tea has pretty much died out, except in one small village where the tradition continues to this day. Each package is about 2 oz, and we hear it is just about the finest loose tea you’ll ever taste. Each bag makes about 28 servings. Go ahead and pick up a bag over at ThinkGeek Caffeine. Find it under the drinks area. ❓ OK, Andru, Have you tried the tea yet? Or is it something I would pull out when I want to gross out my in-laws? They really like tea, but I don’t think that they could get over it being picked by monkeys. Same question as kat, have you tried the tea, if so, what are your thoughts, haha.  It is an interesting name, but I am guessing it will taste absolutely yummy. Tea is tea. Mmmm…. No way,i’ll never have this,who knows what the monkeys did to it. i havent but i seen the article on it on the front page. i wonder how they got those monkeys to pick the tea? it dont sound appealing to me but i’m not a tea drinker either.